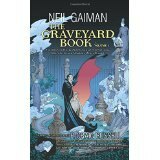 Calling all Neil Gaiman fans: His 2008 bestseller children's book "The Graveyard Book" (HarperCollins, 320 pages, Newbery Medal & Honor 2009) has been adapted by P. Craig Russell into a two-part graphic novel. "The Graveyard Book Vol. 1 (192 pages, HarperCollins, $19.99) was published July 29, 2014 and contains Chapter One through the Interlude, while Volume Two (HarperCollins, Sept. 30, 2014) will include Chapter Six to the end. Both books are illustrated by P. Craig Russell and other outstanding graphic novel artists and will be enjoyed by young adults -- and older ones, too. Nobody Owens, known as Bod, is a normal boy. He would be completely normal if he didn't live in a graveyard, being raised by ghosts, with a guardian who belongs to neither the world of the living nor the dead. There are adventures in the graveyard for a boy—an ancient Indigo Man, a gateway to the abandoned city of ghouls, the strange and terrible Sleer. But if Bod leaves the graveyard, he will be in danger from the man Jack—who has already killed Bod's family. Each chapter in this adaptation by P. Craig Russell is illustrated by a different luminary from the comic book world, showcasing a variety of styles from a breadth of talent. Together, they bring Neil Gaiman's award-winning, nationally bestselling novel The Graveyard Book to new life in this gorgeously illustrated two-volume graphic novel adaptation. Neil Gaiman's work has been honoured with many awards internationally, including the Newbery and Carnegie Medals. His books and stories have also been honoured with 4 Hugos, 2 Nebulas, 1 World Fantasy Award, 4 Bram Stoker Awards, 6 Locus Awards, 2 British SF Awards, 1 British Fantasy Award, 3 Geffens, 1 International Horror Guild Award and 2 Mythopoeic Awards. Gaiman was born Nov. 10, 1960 in Portchester, England.